Enrollment in a Medicaid plan through the Health Insurance Marketplace, a broker, or even state agency doesn’t guarantee someone will get the care they need. Why not? Take a closer look at Medicaid participation for your population. You’ll likely notice that enrollment doesn’t always mean engagement. For example, just because someone receives a Medicaid card in the mail, doesn’t mean they’ll get preventive exams. Even though you’re a healthcare provider who accepts Medicaid, enrollees may not book an appointment for preventive care or minor health issues. And even after an ER visit identifies a significant health problem, a patient covered by Medicaid might not follow-up with a specialist to treat the problem. Do you manage a Medicaid health plan? Do you accept Medicaid as a healthcare provider? Do you work with Medicaid enrollees to use their health benefits? If you want to promote health, prevent disease, and control healthcare costs, participation and engagement is critical to help people covered by Medicaid improve their health. So how can you help your Medicaid population? There’s no one-size-fits-all solution to encourage Medicaid enrollees to use their health benefits. However, learning more about the Medicaid population you insure or provide healthcare services to can help you better understand their health status, risks for chronic disease, socio-economic influencers affecting their well-being, and motivation to make changes for better health. In Alaska, Health and Social Services Medicaid Provider Ken Waugh sees how health insurance and access to affordable care changes lives every day. If you really want to change lives as a Medicaid health plan, care coordinator, or healthcare provider, learning how to increase Medicaid participation and engagement can have a big impact on healthcare costs, outcomes, and the health of every person you insure, see in your clinic, or work with to get the care they need. Medicaid health plan providers in 10 states are currently participating in a pilot study using grant funds from the Centers for Medicaid & Medicare Services. The goal, says lead researcher Dr. Thomas Hoerger, is to improve Medicaid participation and engagement by using incentives. Enrollees can earn cash payments, pre-loaded debit cards, and gift certificates for $20 to $1,150 in California and Texas. Other participating states provide incentives by offering Medicaid enrollees things like free classes, tobacco cessation products and counseling, health coaching, and access to gyms. “Incentive programs offer a potentially attractive means for better engaging Medicaid beneficiaries and encouraging them to change unhealthy behaviors,” says Hoerger. If you’re a health insurance organization that serves the Medicaid population, or you’re a healthcare provider who accepts Medicaid, how can you offer incentives without a budget or grant funding to increase Medicaid participation? Consider partnering with a non-profit or local organization to offer an incentive to increase participation. The incentive could be a gift card from a local farmer’s market given to each person who gets a flu shot. Maybe a neighborhood clothing store would donate a free pair of jeans for each person who attends a weekly weight loss class. Here’s a real-life example. In Massachusetts, one Medicaid health plan provider partnered with the non-profit Together4Health for funding and support to pass out socks to Medicaid’s most vulnerable enrollees. The partnership helped build relationships of trust with the Medicaid population, and ultimately helped people get transportation to see a doctor whenever necessary. Most people own a smartphone, cell phone, or other device capable of receiving text messages. And that even includes people who are eligible for Medicaid. In fact, a recent survey from the Pew Institute found that 86 percent of people with a household income below $30,000 own a cell phone. If you want to improve Medicaid participation and engagement, send text messages. In a clinical trial at Montefiore Medical Center in New York, text messaging by one Medicaid health plan helped enrollees take medications as prescribed and keep appointments with healthcare providers. Want to learn more about how this text messaging program worked to increased Medicaid participation? Check out the presentation, study design, and results from the National Council for Behavioral Health. Here’s another example of a health plan using mobile technology to increase Medicaid participation. In Michigan, OmniCare Health Plan launched a program to provide free cell phones to its Medicaid members, cover monthly service charges, and provide 250 minutes of free voice service. And any cell phone communications with OmniCare didn’t count against the free minutes. The cell phone plan helped OmniCare increase Medicaid participation, get enrollees connected with care providers, and keep appointments. A growing number of Medicaid health plans and providers have found that text messaging is more engaging, interactive and immediate than phone-call follow-ups and snail mail notifications. It’s also more cost-effective over thousands of dollars spent in snail-mail notifications and reminders. Your Medicaid health plan, practice or clinic probably has regular office hours, a website, and phone number. You may even send out regular mailings with information about Medicaid services and preventive care to current and past plan members or patients. But that doesn’t mean people are always going to visit your site, call, or read to get information about their health. How about making it even easier for people covered by Medicaid to ask questions about coverage or care? In California, some Medicaid health plans send representatives out to places like support group meetings, assisted-living facilities, and dialysis treatment centers to meet with Medicaid enrollees. And in some states, Medicaid care managers even go to places like parks and transit centers to visit with Medicaid enrollees, answer questions, and provide information and resources. Instead of waiting for Medicaid engagement and participation to magically improve, take action to increase your influence by networking and creating partnerships with other organizations that serve people who rely on Medicaid for healthcare. You might think networking works best in the business world, and not for improving participation for people covered by Medicaid. But that's just not the case. Networking in any industry, corporate, non-profit, and even state-funded programs and agencies will always help you and your organization make a bigger difference. And that’s exactly what Medicaid leaders in states like Ohio, Wisconsin, Minnesota, New York and others are doing. Partnering with community health workers and non-profit organizations in the community is another good way to build trust and relationships to get information about Medicaid services to vulnerable populations. One major Medicaid health plan is piloting a partnership with local YMCAs to offer Medicaid enrollees a free membership and personal training as an incentive to take a health risk assessment and meet key milestones in their wellness plan. The goal: help Medicaid enrollees learn to eat healthier and get regular exercise to prevent and manage disease. Did you know an estimated 30 percent of Medicaid enrollees have low health literacy? It’s a barrier that negatively impacts Medicaid participation and engagement. And it’s why many states have moved to creating content for Medicaid enrollees with a third to eighth-grade reading level. Even if your state Medicaid program already has health literacy standards in place, take a closer look at all the documents and communications for Medicaid enrollees (emails, brochures, newsletters, web pages, blog posts, text messages, etc.) and see if you can make them easier to read. For example, resources about how to manage blood pressure or diabetes should be written in easy-to-understand language with clear action steps someone can follow. Using a health risk assessment designed specifically for the Medicaid population can also help provide health education and encourage participation and engagement. “The growing trend in the Medicaid program toward lower readability levels is encouraging,” says Medicaid health literacy advocate Aracely Rosales and winner of the Robert Wood Johnson Community Health Leadership Award. If you want to improve Medicaid participation and engagement, look for ways to reduce barriers, use technology, and increase your influence, and you’ll be able to help more people, improve health, and reduce costs. 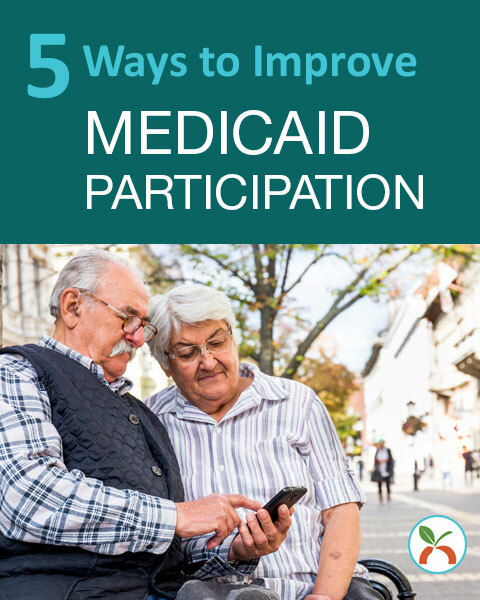 What are you doing to increase Medicaid participation and engagement? Let us know in the comments below.